The other day I came across this picture on Facebook and it immediately reminded me of a book I read called I AM: Discovering The Power of Who You Really Are. It’s still today one of my favorite books because it helped me realize how powerful those two words truly are. 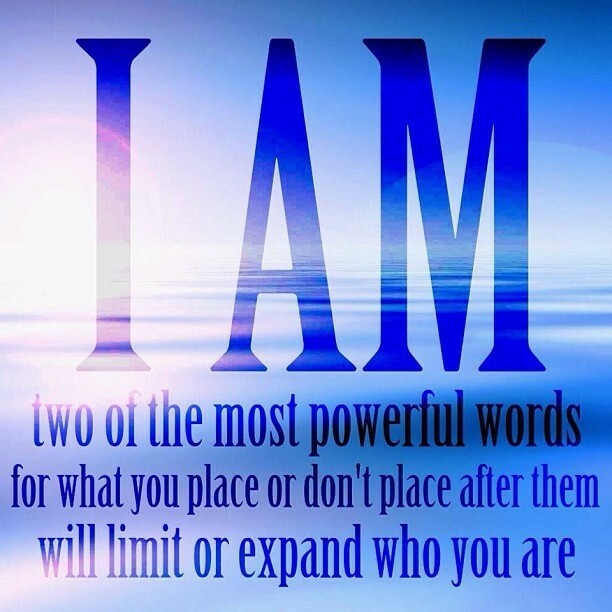 The reason those two words, I AM, are so powerful is because those are the words that help us create our world, our realities. We are always saying to ourselves, largely subconsciously, I AM. It can be as simple as, “I AM bored” or as self-destructive as, “I AM nothing”. What happens is that whatever we say we are, we will subconsciously start creating experiences for ourselves to confirm what we think we are. It’s the way we stay somewhat sane and try to keep our world in balance. If we subconsciously or consciously say and believe, “I AM a loser”, we will continuously put ourselves in situations to lose. We will not try hard to win even if we are lying to ourselves that we are. We are expecting to lose and so it becomes a self-fulfilling prophecy. Even if we somehow win, that will not be enough to change our thoughts of I AM a loser, we will just chalk it up to luck or even say, “I should have loss” or “It doesn’t matter that I won, I AM still a loser”. When we say those words, I AM, we are defining ourselves, how we view the universe, how we experience our experiences and our state of mind. We control all of that. No outside forces, no other person. Even someone in prison has power in choosing how he defines his I AM, his experience. Our internal dialogue is very powerful, that’s why it is important for us to take control of it and redirect it, especially when it’s being self-destructive or not pushing us in a positive direction. Those words, I AM are with us every second of the day. They are so powerful and help us create so much of our emotions, our reality and our experiences that they help us create matter! They help us create matter because they help us decide what matters in our lives. Sometimes when I am working with people that are extremely emotionally charged about something, I’ll stop and ask them, why does it matter? Often times they will stop crying or yelling and look at me with a puzzled look on their face. Then I’ll tell them that it only matters because they are making it matter and if they decide that it no longer matters, it won’t. I could almost see the burden being lifted from them as they realize that they have the power to let go of whatever emotions they had been holding on to (sometimes for years) because they decided to no longer make it matter. Of course it’s not always that simple, but a surprisingly amount of the time it is. So many people are in various degrees of emotional pain right now because they have no real control over their I AM. Who they are, their emotions and who they tell themselves they are on a subconscious level, is heavily influenced by other people and the ups and downs of daily life. If they only knew how powerful they truly were they could bring an end to much of the angst, depression and anger. Fear tends to bring about the very thing that is feared. Faith (not necessarily religion) tends to bring about powerful outcomes. People tend to be products of their environments (but this doesn’t mean we can’t or shouldn’t change). You cannot go back in the past and change anything you did (so don’t keep beating yourself up over it). Failure does not define who you are. You do. You create and experience your life. No one can live your life for you or is responsible for how your life turns out. You are the exclusive author of your story. You are the creator of this experience called life. You and only you can choose your interpretation of and reactions to your life experiences. You control your emotions. You are making it all what it is. Earlier today I was sitting in a meeting, but instead of paying attention I found my mind drifting away, thinking about other things I needed to do that day at work, what I wanted to do when I got off work, a co-worker who was in a bad mood this morning and somehow I had allowed her to get me off center. And then suddenly I came back to the present, back to the sound of our CEO’s voice realizing I didn’t hear anything she had said over the last five minutes. Not a good thing. It was then I realized that I had to set an intention to pay attention. It’s so easy to get distracted by all the noise in our heads, our phones buzzing with messages or even a co-worker in a sour mood. This can be helpful of course when you are doing something like pumping gas and need to notice the suspicious looking person approaching, but it is not very helpful when we are trying to engage with another person or pay attention in an important meeting. Mindfulness doesn’t just happen, you actually have to make the decision to pay attention. This can be part of an intentional practice such as paying attention to our breathing during meditation or paying attention to a loved one and ignoring our phone or any other internal or external distractions. This is even helpful sometimes in the middle of the day when we realize our minds are all over the place, especially when it’s in the future or the past and not in the present. That’s when we need to bring focus back to our loved one that is talking, or our child that wants our attention or like this morning, our CEO who is lecturing. And sometimes we just need to bring our attention back to us, what we are doing in that moment, even if it’s just walking or breathing. This may sound very small, but it is actually often difficult to do because we aren’t always aware of when our thoughts and attention have gone away from where they need to be. The other day I was sitting with my future wife watching a movie, but I realized my mind was somewhere else and instead of enjoying that moment with her I was creating anxiety for myself about a situation that I had no control over. When I realize this I brought my mind back to the present, back to that moment and the anxiety I was feeling dissipated. It’s a powerful thing, that moment when you realized you aren’t focused on the present and then bring your mind and attention back and choose to live in that moment instead of just letting that moment pass you by. Choosing to pay attention is such an easy thing to do, but at the same time it’s easy to forget and harder to do consistently without practice.